It's that wonderful time of year once again, and time for one of the blogging community's favorite events....The Coffee-Loving Cardmakers Winter Blog Hop. I'm participating today on behalf of Secret Garden Crafts; one of the many awesome sponsors for the event. Among many other amazing prizes, Secret Garden Crafts is giving away a $20 gift certificate to their AWESOME store! I created this sweet card using some old October Afternoon patterned papers that I inked. 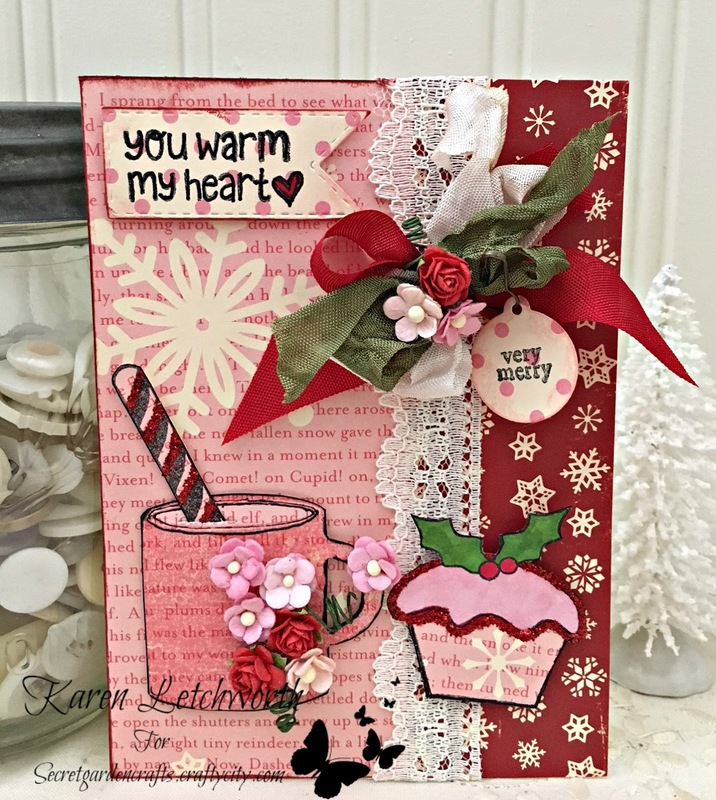 Next, I stamped my coffee mug, cupcake and peppermint stick using a cute stamp set called Homemade With Love; and the sentiment is from a set called You Warm My Heart. I added some red glitter to the stamped images, and attached a seam binding bow with a hanging tag attached by a rusty pear-shaped safety pin. The.....I added the extra sweetness that only flowers can bring. And they're all from Secret Garden Crafts! These sweet flowers just add SO much sweetness and softness to my card. 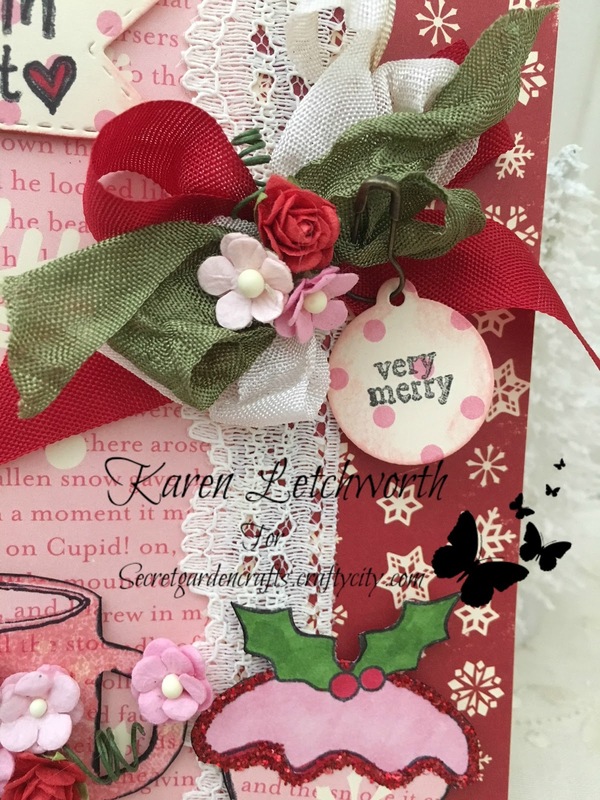 I love adding flowers on just about everything.....and Secret Garden Crafts has all the fabulous styles of flowers we all know and love......and then some more. You will definitely want to stop by to check out all the fabulous choices at Secret Garden Crafts. I attached some Sweetheart Roses and several Miniature Sweetheart Blossoms including Red, and two shades of Pink from the Mixed Pinks Sweetheart Blossoms collection. I assure you that Secret Garden Crafts has the PERFECT color flowers and leaves for your next project. There's always lots of great inspiration on the Secret Garden Crafts Blog, and lots of great deals on the beautiful flowers at Secret Garden Crafts. In fact....check out this fabulous deal for all our Coffee-Loving friends - You can get FREE SHIPPING on all orders of $20 or more. This is a great time to purchase some of these gorgeous flowers for yourself, or for another crafter on your Christmas list. We hope you will visit us soon! 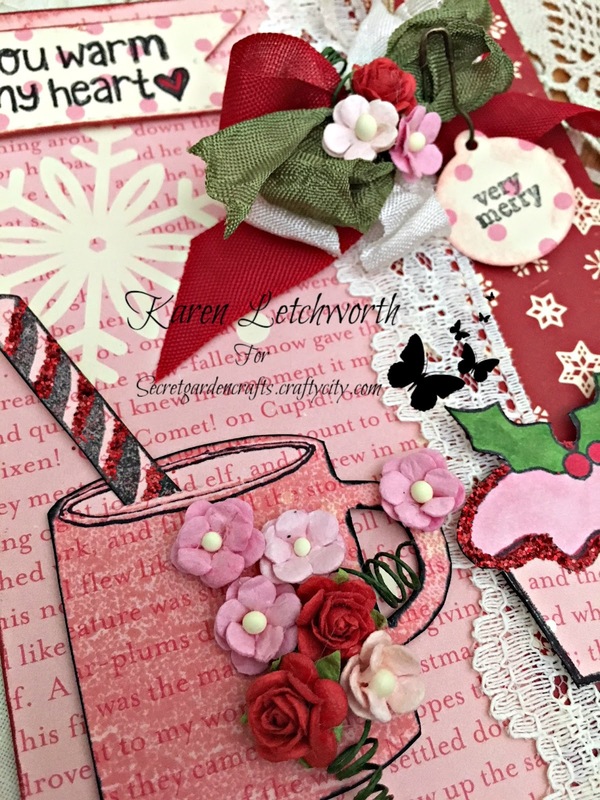 Coffee Loving Cardmakers Winter Blog Hop - I'm so excited to play along again, and I appreciate your comments. I'll be by your blog soon to see your sweet coffee creations! Visions of Sugarplums Challenge - Lori Hairston's ChouxChoux Paper Art - Come join the fun! Beautiful! Love the papers and colors you chose so much! Such a beautiful card. Love all the flowers. This is so beautiful. Awesome papers used on it too. Adorable card! Love all the embellishments and the glittered details!! Gorgeous, Karen! I love the pinks and greens together and always admire your way with ribbons and flowers! Karen, your card is gorgeous. Love that image and those flowers with the ribbon. This is soooo pretty and addition of tiny flowers with sweet mug and a stick made it more beautiful! Karen, this is gorgeous! LOVE all the pink! What a pretty card, Karen! woow super cute, lovely card!!! So pretty, Karen! Love the color scheme and those pretty little flowers you added! Gorgeous creation! Love all of the flowers... love the little charm you created.. the ribbon... love it all! Such a lovely and beautiful card, Karen. Love the colors, layers, cups and those flowers. You always an inspiration! So many beautiful details on your gorgeous card! I totally Love, Love THIS CARD!! You have my address so I will wait patiently to receive - hehe - nice work my friend! Love the pinks and reds and the lace. Oh my, what a beauty with so many wonderful elements to look at! This pink is beautiful, LOVE this card so much!